My birthday is coming up, but I won't actually be at home (nor will my grandparents) so my Nana made me a cake this weekend. I love cake) Today was really quiet - we didn't do much of anything save for me cleaning up my room a bit in preparation for the move. There's still a lot to get done, but 3 weeks is a ways off still. We looked at some really old slides tonight, this one in particular was really sweet (it's me pretty much a few days old). 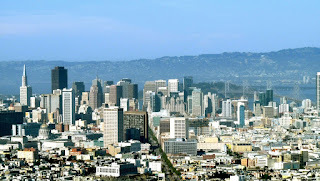 Tomorrow we're going to a baseball game, and on Tuesday I head back for San Francisco. Exciting week ahead. And so ends another chapter of education as Teenie graduates high school, class of 2009! She'll be starting at USF in the fall and I wish her only the best. 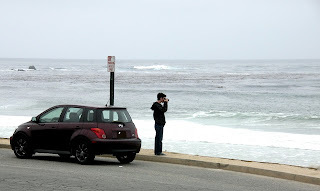 In other great news, today I was offered a position teaching and tutoring mathematics for the summer here in southern California while I continue the hunt for a job in San Francisco. I'm happy to know that there's some stability for me still in this market - but it's going to be really hard to leave the bay and move home. Thing's always work themselves out in the end though, and everything works towards some greater end. But today is Teenie's day and I'm thrilled to have such a successful little sister. So I finally have my car back nice and washed and in the light (I was embarrassed at how dirty it was last week, so the picture was in the dark). Driving home this morning was nice - made a lot nicer thanks to Audible.com and their free trial deal that got me Anathem on audiobook for free. I was happy to listen to 5 hours or so of the book (it's 32 hours long though). I had the birds in the backseat - I think they were thrilled to hear someone talking to them the whole way down. It's nice to be back down in the valley - a little warm out, and the house is a little bit crowded, but I really don't mind. Teenie graduates high school tomorrow - which another big achievement to celebrate - we're looking forward to seeing her walk tomorrow evening. 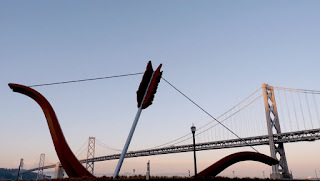 The Bay Bridge and "Cupid's Span" by Claes Oldenburg and Coosje van Bruggen. I love this sculpture - though some lesser art enthusiasts though it was ugly in Bunny's Studio Systems course. Bunny & I don't know what they're thinking (they must not appreciate San Francisco very much). This week has been very touristy for us, exploring all over the city and around, and taking pictures for everyone that sees my new camera and thinks I'm a great photographer - if only they knew :) I head out tomorrow morning first thing to get back home for Teenie's graduation - I'm looking forward to the weekend - but this picture should tell you where my heart is staying. View from Twin Peaks, and I had to take photos of tourists again. We spent the afternoon exploring the city a little - getting lost looking for the Samovar Tea Lounge that we have yet to actually visit. Going back to work was fun, and Safeway sells a new line of flash frozen fish that are actually really tasty and fresh. I was exploring around the city today with Bunny and we went (for my first time) to the concourse of the Golden Gate Bridge. 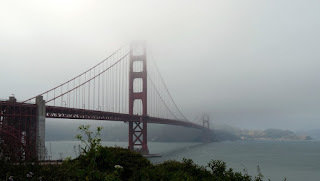 It was a bit foggy so of course part of the bridge is hidden, but I've come to expect that most days in the city. Also, due to my now "very nice looking camera" (as quoted by random guy #1) I was asked to take photos of tourists with their cameras - I hope I preserved their memories well. After the bridge, Bunny and I wandered around the Palace of Fine Arts and were warmed by the sun peeking out over the dome. As we were leaving the Palace, we were flagged down by a group of people whose car had died and were desperate for a jump. They called me "their angel" and were really happy that I had the cables and was willing to stop for them - I was glad to pass on the acts of random kindness. Tonight Bunny & I saw "Night at the Museum: Battle at the Smithsonian" and while I'm not sure if it was better than the original, it was definitely an enjoyable movie... I don't think it's doing too well in the box office however, there were less than 10 people in the theater for the late showing (I hope it was simply because it was a later showing and parents brought their kids in earlier). At any rate - we had fun. So my extended vacation ends and I have to work tomorrow - but it should be fine, I'm sure there's lots to catch up on. I graduated. I woke up this morning, went to the ceremony, and had my name called. I wore the robe, that goofy cap, and the hood that doesn't really hood anything. I have officially finished college as of today. Now I wish I had a photo of myself during the ceremony (or afterwards) as the photo for my blog tonight - I mean, part of the reason why I started this was to chronicle my senior year of college - but unfortunately, I don't have any of the pictures that were taken of me today. 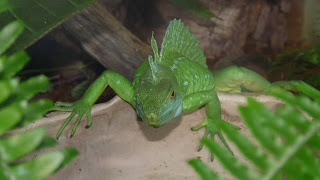 So instead I treat you to this photo of the Basilisk from the Academy of Sciences. This is the same animal as the last time I posted him, but tonight he is brought to you courtesy of my brand new Panasonic Lumix FZ28 camera! For now, it is simply the magic camera, because 90% of the photos I took today are of the same quality. I'm really happy with it. But on this momentous occasion, I wish to regale you with the story of my day. Yes, I had to wake up early, and sit at the ceremony; but my family was sitting in the front row of the audience, which was GREAT! I was thrilled tah teveryone was there for me and whooped and cheered louder than any other family (or at least that's how it seemed). After the ceremony (and all the pictures) we had a big lunch at Kitaro where I had the opportunity to try grilled squid for the first time (I love calamari, but never had the squid prepared just as itself - it reminded me of steak). This afternoon I spent time with my uncle, aunt, and cousins at the Academy of Sciences where we put my camera through a rigorous first photo shoot - it was awesome. Finally, tonight was our big family gala at the Mona Lisa restaurant in North Beach. A nice big celebration with everyone who's supported me so much over the last 4 years. I wish everyone in the family could have come, but they were not forgotten. My family and friends have been so wonderful and supportive, and given so much of their time and love to me over the years I don't think I could ever thank them enough. But tonight my best wishes and thanks to everyone because you all helped me get to where I am today, and I won't ever forget that. Let's call this a teaser since it's dark and you can't possibly grasp the beauty of this vehicle without proper lighting (yeah, I'm sure you agree with me). I'm just happy that I have the keys again! I can't believe that I've now completed my 4 years of college and tomorrow (in about 9 hours) I graduate! But tonight, I do have to wish my little sister happy birthday and focus on her for a bit. I'm really glad that the family is up here and I had a wonderful time catching up with my grandparents and sister - tomorrow will be so great. I need to get some rest - waking up at 7 to take my final at 8 this morning wasn't the most pleasant experience, but I didn't think the test was as horrible as it could have been, so maybe I did alright. Studying helps but there's luck involved too I think. Windows 7 Ultimate Release Candidate running on my MSI Wind - the system is smooth, fast, and gorgeous. I'm not sure why it's not displaying how much Ram I have installed (the system works, that's all that REALLY matters). I studied for one of my math exams today, cleaned my room, and watched a movie. I have Stanley Kubrick's "2001: A Space Odyssey" based on Arthur C. Clarke's novel of the same title - and think it's a fascinating and terrifying film (really works the creepiness of being in space with a derranged computer angle well). But today I watched the sequel, "2010: The Year We Make Contact" and I must say, it is a FAR better movie by just about every count. Now, I actually think that they're two separate genres, because 2001 is more of a sci-fi horror movie, where as 2010 is pretty much just pure sci-fi'y goodness (a little tense, but nothing really scary) - and the ending of 2010 is MUCH better than the pure oddity of 2001. Seeing 2010 makes me curious about the other 2 novels that followed (there were 4 by Clarke that travelled on this timeline). Some packages have appeared with my name on them - but I was given explicit instructions to not open any box that arrived so I can't look inside...until graduation. Speaking of which, today I went to my LAST COLLEGE CLASS! I don't have any more days of learning left in college, I'm in shock. All of my homework is finished, and all that's left is finals. I have 4 days left of college (as in 4 days where I'll be in a classroom at some point, 3 if you figure that one of my finals is just dropping off a paper). It's a pretty amazing feeling to have gotten this far, next week is only going to get more exciting as I approach Friday. So tonight Bunny & I watched "Trekkies" the documentary about the Star Trek fans that go by the same name - wow they're kind of eccentric to a degree that I never want to be. There's even multiple terms - Trekker and Trekkie (although no clear definition separating them). On a related note - my Enterprise Statue was delayed (again!) and won't be shipping until June 3 (which is kind of bittersweet, I'd love for it to ship on my birthday). Busy day, busy night - tomorrow is a day off, which should be nice except that I have to revise a term paper for Friday. Oh yes, and there is a woot-off right now! 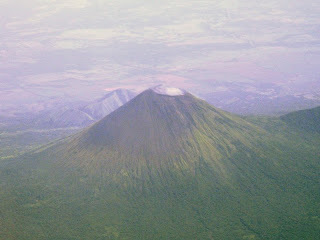 Yes, this is a VERY noisy photo - but give me a break, its a volcano that I took a picture of from an airplane (not the greatest conditions). Wow so tonight I'm late posting, but it's because I'm trying to get a paper finished. Well, it's pretty much done, but I want to work on the extra credit paper too - so I'm going to be a while. I FINALLY heard back from somewhere I applied, but the tutoring position has really small hours to start, which is kind of the opposite of what I need. Hopefully though, something else will present itself. Today has felt like non-stop, but really I have ONE DAY of class left (my Thursday class was canceled!). One day of class, and 3 days of finals...that's the end of college for me. Also, I'm super excited because I bought Emmanuel's plane ticket to come visit me in June :) It's his birthday present from me - it should be a really awesome weekend when he comes up. 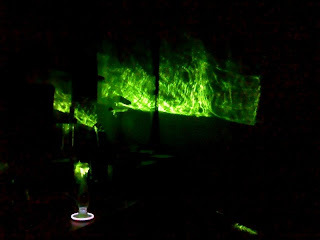 More laser beaming fun - this time with a vase & crystal on top of my mir:ror (yay for glowing light rings!). One day of classes down, three more to go (I didn't think there was school on Thursday, unfortunately, there is). I feel a little stressed, a little excited, and a little overwhelmed with all of the things I think I have to get done, but the reality is that my workload this week isn't any heavier than it's been all year and I'm perfectly capable of getting it all done in time. I don't have a lot else to write about - school is being school, work is being work...and taht's about how it should be for this week. Maybe by Wednesday things will feel like they're all truly winding down, but today was just another manic Monday. 3 days of college classes left. That's it...then I'm finished and have finals. Honestly my mind is trying hard not to melt down. I was feeling kind of nostalgic (and relieved) as I finished grading the last set of papers for math 100 today. So many things are going to be happening and changing, I'm really excited and scared at the same time. 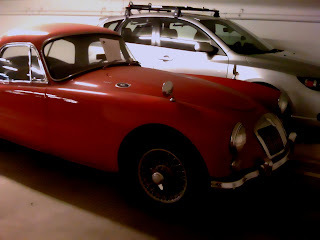 This little car was in the Lucky's garage last Friday - it's an MG MGA and in pretty good condition. The note on the windshield is the management telling the owner to move the car, and apparently security likes the car too, they watched me take this photo. Marie's birthday was today, and it's mother's day - so my best wishes to all on this evening, I hope the day was wonderful. Tonight I had a nice dinner at home with Marie and Nick, we ordered from Star India, our favorite Indian restaurant with super convenient online ordering. And I finished backing up my Star Trek DVDs - 211GB total (but I had plenty of space for them) And now I don't have to open all those boxes up to watch the shows. Bunny's art is in the Thatcher Gallery! Whoever gets a chance to should really go check out her amazing paintings, Cross Polination, Ascent, and Theater, they're much more beautiful in person (harsh lighting meant it was hard to get a good photo). The other works are alright, but a lot are meh to me (meh meaning I'm indifferent and show no favor nor specific dislike). I was kind of disappointed at the selections for awards, the student choice award went to a particularly ugly portrait of a professor's baby (as opposed to beautiful paintings and sculptures in the gallery) - clearly I wasn't on the selection committee. And tonight I am fueld by Mountain Dew Throwback, so potent with REAL SUGAR (not evil high fructose corn syrup) that it actually glows on its own. This weekend should be busy with plenty to do, but I'm sure I'll get it all done. Also amazing today - the Augmented Reality Star Trek Experience - this is really just super cool - I tried it with limited success (because my webcam is attached to a notebook with a 10" screen, not really ideal) - but it's so amazing to see the virtual Enterprise show up on screen. I also watched the second to last episode of Star Trek: TNG tonight - I only have one more episode before I've finished the ENTIRE 7 Seasons! And what will I do once I've finished? Go back through all 7 seasons and note my favorite episodes, obviously. Then watch the movies eventually. When they're on blu-ray for more amazingness. Schubert's again - this time White Chocolate Raspberry Mousse and Current Mousse - Delicious! I got a haircut for graduation today - pretty short - but it's so that I don't look goofy with hair sticking out of my cap on the day. Bunny and I rented "10 Things I Hate About You", a movie from 1999 that places William Shakespeare's "Taming of the Shrew" in a high school setting with Heath Ledger and Julia Stiles. I'm not a big fan of William S., but honestly this is one of my favorite movies of all time, mostly because it's so well done for being such a ridiculous story. Basically it's; boy likes girl, girl can't date, boy finds another boy to pay another boy to take out girl's sister so that boy (first boy) can date girl, who likes the boy who's paying the other boy...but then the paid boy falls for the girl's sister...and so on and so forth. But I recommend it to anyone who can sit through a silly teen romantic comedy with silly clothes and lots of indie music from bands who never made CDs. 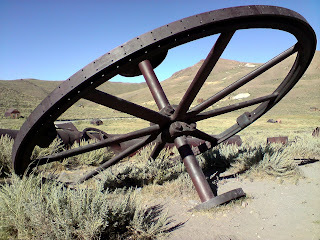 Giant wagon wheel at that ghost town my dad and I went to over Labor Day last year. I'm really tired tonight, so I don't have a whole lot to say - classes felt like eternity, and working on a mathematica lab wasn't quite as successful as I hoped. I did manage to get my hands on all needed graduation tickets - so Roscigno's reading that are coming to visit me in 2 weeks, rest assured you'll be able to sit in St. Ignatius for a few hours together. Beyond that, nothing worth noting here. I have a week left of class and a week of finals - someone stop this train before it overheats please. Oh what a night! It's really quite nice out - despite it being quite hot in my bedroom (running a computer all afternoon will do that...but those backups don't make themselves!). It was a bit rainy, a bit humid, and a bit breezy today, all types of weather I enjoy, just not necessarily all at once. Tonight I'm enjoying the quiet and the lovely roses from Bunny's mom's garden - they're really lovely, and I can smell them when I turn over in the night. I went on an adventure for ice cream tonight - I was thinking about a Choco Taco in honor of Cinco de Mayo, but ended up discovering that the 24-hour Wallgreens doesn't carry them and got Ben & Jerry's instead, which is probably better since there's no HFCS in their ice cream. I'm really starting to feel the semester wind itself down now, I have one week of classes left and it's not showing any signs of slowing down. Although the abrubt halt next week will just remind me taht I have finals in 2. Lots of tasty fishes for me! Bunny and I returned to Sakana Bune (I just learned the name today!) 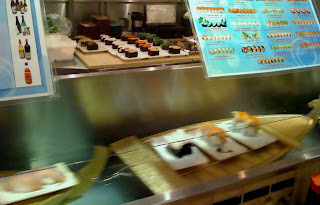 I highly recommend it, and the boats are tons of fun for atmosphere, and the sushi is phenomenal. I'm really getting into the Eco Trip series on Netflix - except that it's making me want to go all organic which is daunting financially. Organic t-shirts are expensive! But I got an organic chocolate bar from Trader Joe's and Bunny's been buying organic fruit & veggies for years, so we're working towards that end slowly but surely. It started to mist and then rain today - which is nice considering how dry it's been (and windy), but hopefully it won't pour - I don't like carrying an umbrella. I have 4 or less lectures in each of my classes from this point forward - how exciting (I was going to say scary, but I'm really not that scared, it's just going to feel like forever even though my days still feel long). Today was the Polish festival in San Francisco. Bunny & her dad & I went and had some really good food and watched some folk dancing - and I really have to wonder whether or not the studio that teaches these kids ONLY teaches them traditional folk dancing, or if the kids only get into costume to dance once per year. The walk home was really nice through the closed-to-cars park and the misty air. Tonight we watched "Sketches of Frank Gehry", a documentary about the architect of the Guggenheim in Spain and the Walt Disney Concert Hall in Los Angeles - really interesting insight into the mind of an architect/artist - I think Marie would enjoy it. And my laser totally rocks in the fog. I couldn't get the effect on this one quite right - a macro lens would have been great - but these are fun little magnets on the fridge set up in a precarious situation. 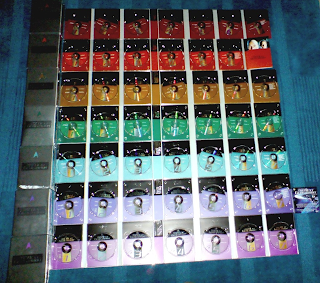 I spent a lot of time today transferring my Star Trek DVDs onto my desktop with a really nice combination of software - DVD Shrink and DVD43 for ripping the discs and DVD Rip from Lifehacker to automate everything. I got 2/7 seasons done - 63GB today. Beyond that I had some really great BBQ with Marie, Nick, Sterling & Virgil, and listened to a lot of Pandora. I also watched an episode of a really great show from the Sundance Channel on Netflix - it's called Eco Trip. The basic premise of the show is showing the environmental impacts of various products such as chocolate, cell phones, and t-shirts. I watched the first epsiode about chocolate and I think the show makes an excellent point about being more aware of what you eat and buy. I was also a little biased because of a podcast I like, "Stuff you should know" (iTunes link), teaching me a lot about high fructose corn syrup I didn't know; Did you know that the chemical normally produced to tell you that you're full isn't created when you consume hfcs? And that hfcs - which is fructose of course, can only be used as sugars for the liver, whereas natural sugar, glucose, can be used by virtually every cell in your body? When fructose consumption reaches its threshold in the liver, it is turned into triglycerides (fat)... basically the moral is avoid hfcs as much as possible (which is hard because it's in a TON of foods nowadays). A little bit is ok though. Also - I tried Virgil's Crocs on - I'm totally getting a pair (just not the clogs). I'm looking forward to the Polish Festival tomorrow afternoon, should have some really great food and the dancing was entertaining last year. p.s. - let me know if you like having links to all these things I talk about. 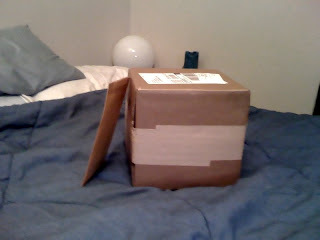 This will mark the 147th blog post at JohnRoscigno.com and on this occasion, I've managed to accrue 1000 (!) Tweets on Twitter in slightly less time. I've managed to get a few new followers over the last couple weeks, which is pretty awesome, and over 3000 visits over the lifetime of this blog! (full disclosure: not unique visitors). I'm the first hit at on Google and have a comment from another John Roscigno (who's not my dad). Meanwhile, it's Marie's friend Sterling's birthday today, we had a lovely cake from Schubert's Bakery. I had some computer problems earlier this afternoon, but with a lot of work (and system restore) I have everything working nicely tonight. And this post is brought to you courtesy of an Apple Airport Extreme router (not mine) - visiting our apartment for a few months from Nick - which has been stable since we got it hooked up properly (despite some networking problems with my printer). Apple is giving me a strong case to convert from Windows - We'll see what's in the cards in months to come. 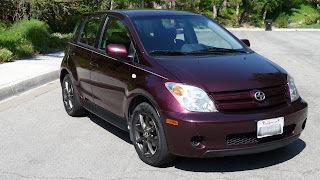 EDIT: Let me just say, I am really not an idiot - but this is the 247th blog post. 247!